Raccoons are one of many wildlife pests that wreak havoc on personal property. Not only do they cause damage, they also carry diseases and create messes. If you are experiencing raccoon troubles, then a call to a pest control service that handles raccoon removal like Modern Pest Services might be in order. With their dark mask and mischievous curiosity, raccoons always seem to be up to no good. The raccoon is a nocturnal mammal, which means that it spends majority of its night scavenging for food. As a result of this, many individuals wake up the next morning to find their trash scattered across their front yard. Raccoons prefer wooded areas near a water source as this is their natural habit, however, they have adapted extremely well to the urban environment. Instead of making their home in a tree, they often nestle in accessible areas in your home such as an attic or chimney, or underneath a deck, house or shed. Because raccoons are nocturnal, it may take a long time to even know that you have a raccoon problem. However, if a raccoon has made it into your home, it will not take long to hear them scurrying about over your head. At this point it’s a good idea to call a professional pest control company that handles raccoon removal. 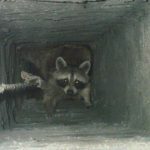 The damage created by raccoons can be extensive, but the hiring of a raccoon removal professional as soon as raccoons are suspected can make all the difference. Some companies will provide raccoon removal and remediation or clean up services and repair the damages created by the pests. Not only will the damages be fixed, but professional pest control companies work to prevent raccoons and other wildlife from entering your home in the future. 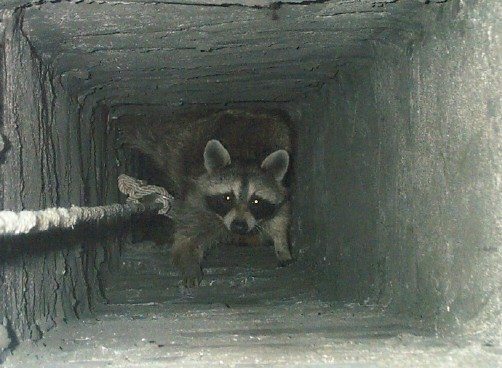 It is important to shop around to make sure you find the best pest control company to perform the raccoon removal as some provides services that others do not. Some companies offer exclusion, remediation, trapping, damage repair and preventative techniques. It’s also important to find a company that handles pests humanely and responsibly. Raccoons are destructive animals, but all is not lost if you find one taking up residence in your home. Modern Pest Services offers wildlife control and can help make the raccoon removal process quick and easy for both the homeowner and pest. If you’re experiencing a raccoon issue, give us a call at 1-888-997-3312.